You can view and restore the previous DNS settings you used for a specific domain, as long as the 'Advanced Domain Settings' are active in your control panel. In this article we'll show you how this works. Scroll down on the right side down to the 'Advanced domain settings' > 'DNS'. Are the 'Advanced domain settings' not enabled? 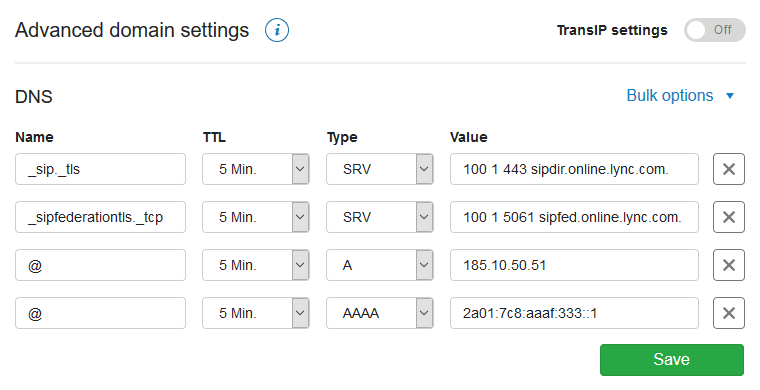 Click the little switch behind 'TransIP settings' so that the TransIP settings are disabled. You'll then see an overview like in the screenshot below (but probably with more DNS records). Behind 'Dns' click on 'Bulk options'. Behind 'Restore a previous version' click the date of which you'd like to restore the DNS settings. 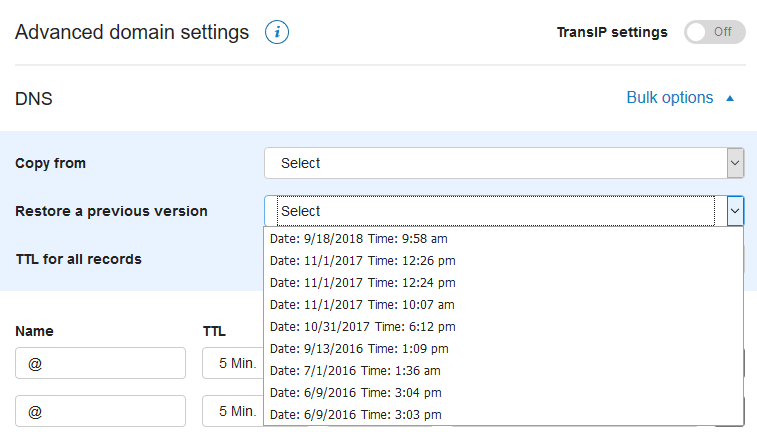 You'll immediately see a preview of the DNS settings of the selected date in your DNS settings. Click 'Save' in the bottom right of your DNS settings to restore the selected DNS settings. Please note that it can take up to 24 hours before DNS changes are processed everywhere. This is caused by DNS cache which is stored in remote 'caching nameservers' for a period of time. Generally speaking these changes are usually visible long before the 24 hours have passed.